HYUNDAI GENESIS LAUNCH SITE: The most informative car website ever, for anyone questioning if Hyundai can actually make a luxury car. Hyundai wanted to break into the luxury market, but most people thought of Hyundai as a discount brand. 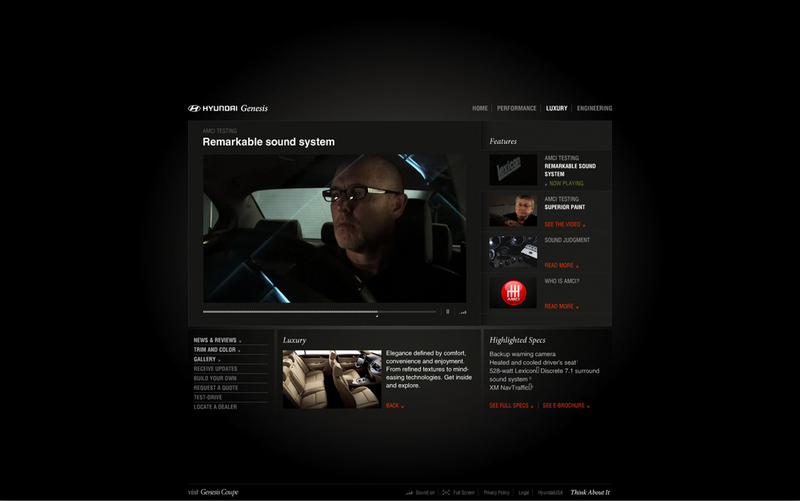 To prove that Hyundai knew everything that makes a luxury car, we made a site that dug insanely deep into the details of the car, saying more than just "horsepower" and "supple leather." We also made a teaser site featuring Jeff Bridges doing the voiceover.